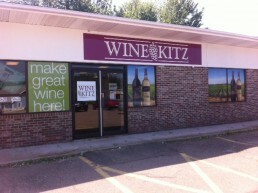 Making Wine with Wine Kitz Truro is Easy! We’ll help! Just tell us what kind of wine you enjoy, and we’ll help you pick a wine to make that suits your tastes and budget, from fresh and ready in four weeks to “big” reds that age well for years. You can also make delicious fruity wines – perfect for summer – and dessert style wines. Our state-of-the art In Store Winery has all you need to make wines you’ll be proud to share with family and friends. From mixing up your batch to bottling, and even adding labels and matching shrinks, we offer all the equipment and supplies you’ll need. We leave the fun things for you: bottling and corking your wine, adding labels and matching shrinks. The only thing left is to enjoy your wine!